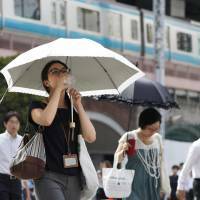 Japan recorded its highest temperature ever Monday as the mercury hit 41.1 in Kumagaya, Saitama Prefecture, amid a deadly heat wave, the Meteorological Agency said. 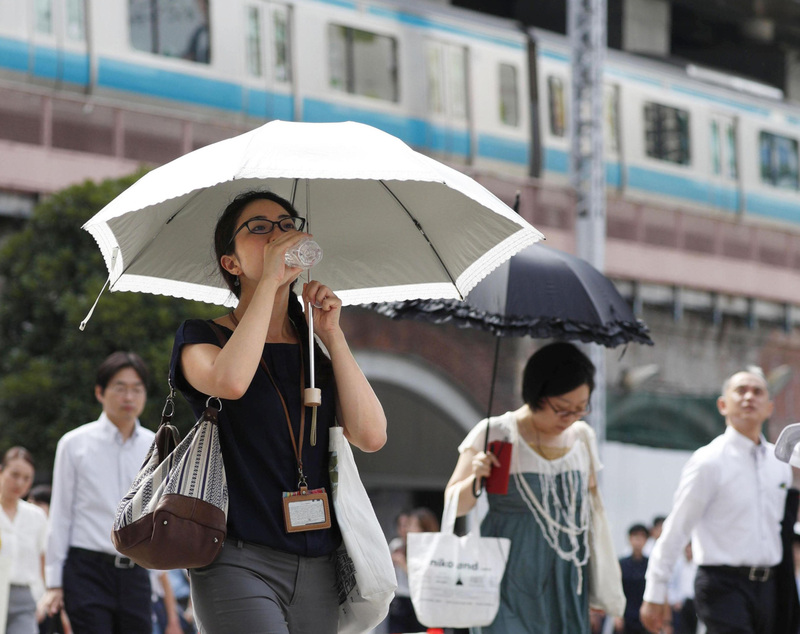 Scorching weather killed 77 people and sent more than 30,000 people to hospitals across the nation from July 9 to Sunday, according to the Fire and Disaster Management Agency and a Kyodo News tally. At least nine people died Monday. The temperature also hovered near a record high in Tajimi, Gifu Prefecture, which saw the mercury touch 40.5 on Monday after hitting 40.7 on Wednesday, the agency said. The heat wave has been baking the nation for weeks while survivors of the rain disaster in western Japan continue to recover from fatal floods and hundreds of land slides earlier this month. Despite warnings about the heat across the nation, at least five people — all senior citizens — died in prefectures around Tokyo from Sunday to Monday, local authorities said. The victims included a 90-year-old man in Chichibu, Saitama Prefecture, an 89-year-old man in Namegata, Ibaraki Prefecture, and a 95-year-old woman in Sano, Tochigi Prefecture whose deaths are thought to have been caused by heatstroke. The other two, who also died in Saitama, were an 85-year-old woman in Kuki and a 72-year-old woman in Asaka. The Tokyo Fire Department dispatched ambulances 3,125 times on Sunday alone, the largest figure for a single day since it began emergency services in 1936, apparently due to a surge in the number of people falling ill from the intense heat. As of Monday, the number of people who have been taken to hospitals by Tokyo’s ambulances due to heatstroke this year stood at 3,544, already surpassing the 3,454 for the whole of last year, according to the department’s preliminary report. The intense heat has prompted the Meteorological Agency to issue advisories urging people to drink water frequently and take measures to prevent heatstroke. At a news conference Monday, the agency said the heat wave is expected to continue into early August in both western and eastern Japan. “Please be aware of heatstroke, and make sure to keep yourself hydrated and consume adequate salt,” an agency official said. Japan’s summers are notoriously hot and humid, and hundreds of people die each year from heat-related illnesses, particularly the elderly. But this year’s scorching weather came as a surprise and has since revived safety concerns about the 2020 Olympics, which will be held in July and August, typically the hottest months of the year. Olympic officials and the Tokyo Metropolitan Government are examining such measures as solar-blocking road paint and mobile misting stations to reduce the heat.